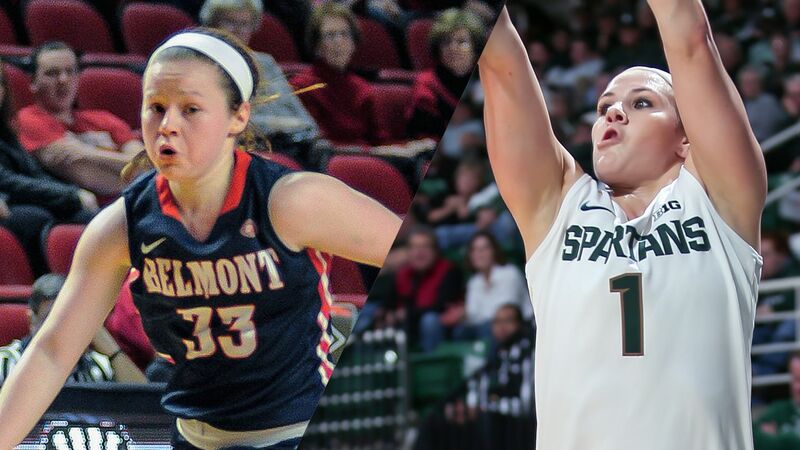 Michigan State pulls away to beat Belmont 74-60 - Women's College Basketball - Are You Watching This?! STARKVILLE, Miss. (AP) Michigan State's Aerial Powers glanced at the shot clock during the fourth quarter, realized there were two seconds left and fired an off-balance 3-pointer from 25 feet away. It banked off the glass and through the net. She couldn't lie - that's not exactly how the play was planned. But much like the rest of the game, everything worked out in the end. Fourth-seeded Michigan State pulled away for a 74-60 victory over No. 13 Belmont on Friday, fighting past a feisty underdog that kept the game close until the fourth quarter. Aerial Powers scored 27 points - including 19 in the second half - and 6-foot-3 Jasmine Hines added 24 to give Michigan State a potent inside-outside combo that finally wore Belmont down. The Spartans (25-8) started the fourth quarter on a 10-0 run to turn a 52-47 game into a relatively comfortable victory. Hines and Powers combined for eight of the 10 points during the decisive stretch. Hines, a fifth-year senior who missed most of last season due to injury, made 9 of 12 shots from the field. She more than doubled her season average of about 10 points per game. ''It's always nice to have a good game - and I love tournament time,'' Hines said. Michigan State shot 17 of 32 (53.1 percent) from the field in the second half and finished with a 39-32 rebounding advantage. Belmont (24-9) was led by Frankie Jourban's 17 points while Kylee Smith added 16. The Bruins took a brief 22-20 lead early in the second quarter when Sierra Jones hit a 3-pointer, but Michigan State scored the next 10 points to regain control. The Spartans found some easy shots around the rim for the Hines, who led the team with nine points in the first half. Michigan State threatened to pull away midway through the second quarter, but Belmont stayed close thanks to a couple timely jumpers by Joubran, who came off the bench to score nine first-half points. Michigan State took a 34-30 lead into halftime. The third quarter stayed close with Michigan State doing just enough to keep the lead. Belmont's Smith and Darby Maggard found some room for open shots despite the Spartans' superior size and athleticism, giving the Bruins a chance for the upset going into the final quarter. ''Our kids hung in there and fought right with them until the end,'' Belmont coach Cameron Newbauer said. But the combo of Powers and Hines proved too much for the Bruins to stop and the 10-0 run to start the fourth quarter put a dent in Belmont's momentum. By the time Powers knocked down her long 3-pointer off the glass, the game was essentially over. ''We tried to exploit some weaknesses, but they had some kids hit shots at big moments,'' Newbauer said. ''Some people might say that Aerial Powers banking in that 3-pointer was luck. Michigan State: Powers became the school's all-time leading scorer and now has 1,803 career points. She came into the game in second place, trailing Liz Shimek, who scored 1,780 career points. ... Michigan State is playing in its 15th NCAA Tournament. Belmont: The Bruins were on a roll entering the NCAA Tournament, winning 16 of 17 games, including the Ohio Valley Conference tournament. ... Belmont played in just its second NCAA Tournament and first since 2007. Michigan State will play host Mississippi State in the second round of the NCAA Tournament on Sunday.